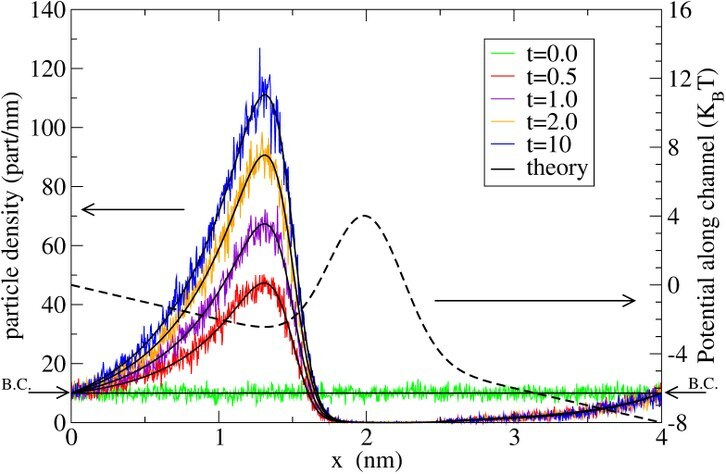 The work of Laureano Ramírez-Piscina in Physical Review E on the Langevin formalism of diffusion in channels last July has been selected by the editor as one of the main contributions to statistical physics in the journal. Ionic diffusion along molecular channels regulate important physiological functions in the cell membrane, such as action potential propagation, muscle contraction, regulatory cycles, etc. In Langevin simulations of the ion dynamics along the channel it is necessary to consider special boundary conditions at both channel ends, namely the values of the ionic concentration which have to match concentrations inside and outside the cell. Previous algorithms for these boundary conditions presented several problems, both conceptual and practical. Laureano found a solution surprisingly simple and elegant, which does not have any of these problems. He published this results last July in Physical review E. The article, moreover, provided the correct concentration values at the boundary during transients and during short simulations, without the apparition of spurious boundary layers like in other methods. Due to this simplicity he showed that it is straightforwardly applicable to complex and realistic situations, either for channel dynamics or in general for other diffusion problems. The editor of the journal took the work of Laureano as cover of the journal in the July 2018 issue making it one of the 25-most relevant published articles in its last volume, which encompasses around 1000 articles. Physical review E is the APS journal of reference for the interrelated areas of statistical, nonlinear, biological, and soft matter physics. We can say that one of our own researchers make it on the top 20. Laureano belongs to the consolidated research group Computational Biology and Complex Systems. BIOCOMSC.